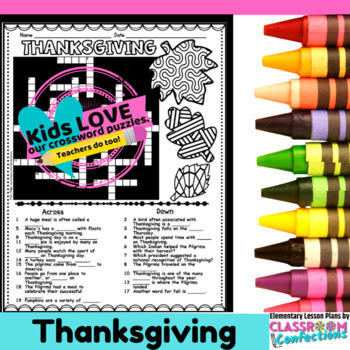 Your students are sure to enjoy this fun Thanksgiving crossword puzzle. This pack comes with a crossword puzzle, answer key, and a word list. There are fun themed patterned pictures for students to color if you need to give them some down time. What does research show about crossword puzzles? In addition to the above benefits, students are also working on vocabulary, spelling, reasoning, context use, and word attack skills. Students need to evaluate choices and draw conclusions. On top of all that.... they are FUN! 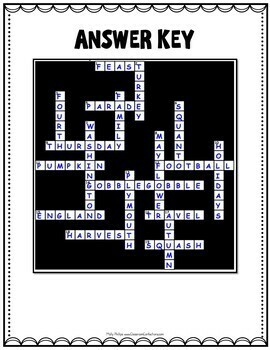 The Thanksgiving crossword puzzle comes with a separate word list if you want to give it to students when solving the crossword. The word list prints 3 to a page. This might be something you want to consider for 2nd graders. Consider your students' ability levels when deciding whether or not you want to give them a word list. For students in third or fourth grades, I probably wouldn't provide a list. It also comes with a fun themed image that students can color if they have extra time. Coloring offers a stress-free time to wind down. How might you use crossword puzzles in the classroom? ✱Use the words from the word list in a sentence, using the words in context. ✱Quiet morning work activity for students on the day of the holiday or the day you are introducing the topic shown on the word search. ✱the list goes on and on for ways to incorporate the crossword, as well as the word list into the puzzle. 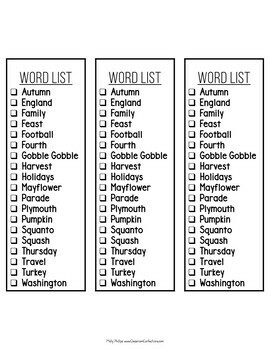 What words are included on the word bank for this Thanksgiving crossword puzzle?